In 2009, a bored computer programmer and video game designer named Magnus Persson — soon to be better known by his alias, "Notch" — quietly released a charmingly low-resolution project called Minecraft. It combined adventure and role-playing elements with building blocks to create what's now referred to as a "sandbox" game. Like playing in a sandbox, in which a player's only limit is the depths of their imagination, there's no set story or goal in Minecraft. Instead, players control a regular guy named Steve or a regular gal named Alex as he or she mines for materials and uses them to build structures across an array of terrains and biomes — while looking out for deadly and destructive villains like skeletons, zombies, and a horde of green monsters called "Creepers." 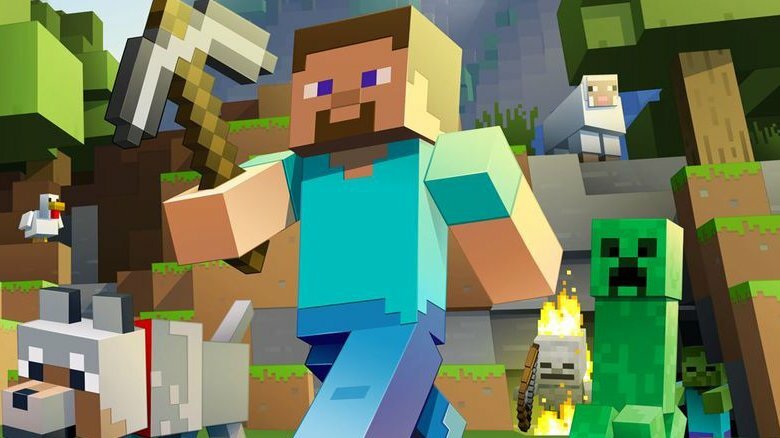 In just a few years, Minecraft became one of the most downloaded and played games in history. Perhaps because of its friendly look and anyone-can-play sensibility, it's been hugely successful with kids…which means their parents have had to endure an untold number of conversations about Minecraft and having to watch their kids play the game. Naturally, adults have a very different take on the game — they may see things that only time, experience, and an aged, world-weary eye can reveal. 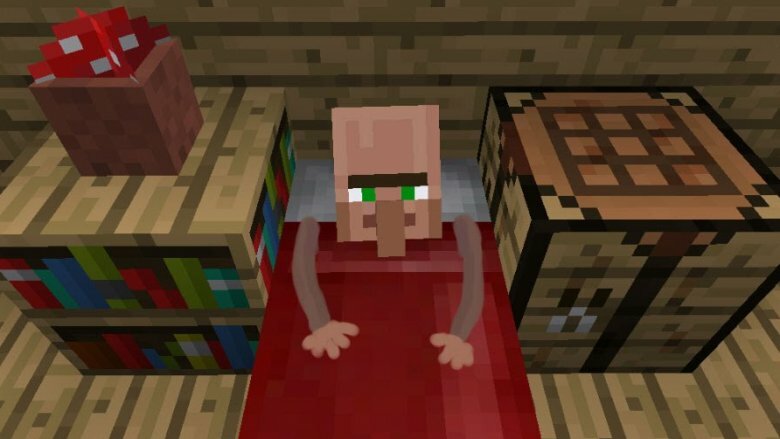 Here's a look at some of the silly, dark, and just plain weird things in Minecraft that only adults notice. 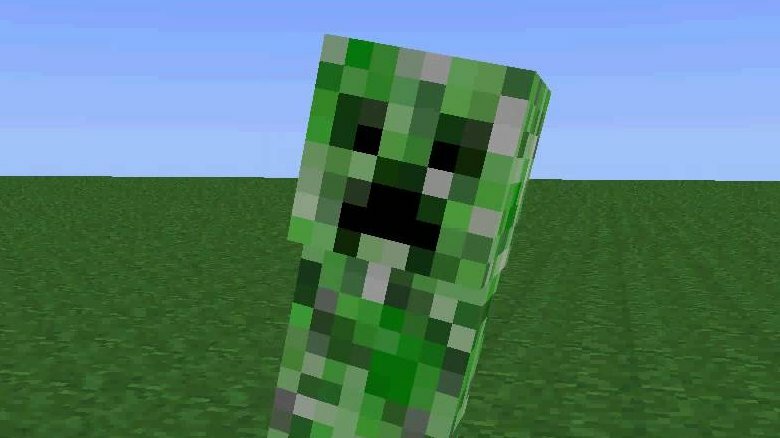 Creepers are rightfully one of the most notorious bad guys, or "Hostile Mobs," in the game. These green camouflage monsters wander the lands of Minecraft until they explode. One second they're a sickly green presence with an arrangement of some eight-bit black pixels on its face suggesting a ghostly frown; the next, they've blown up, probably in the vicinity of a building that a player poured their heart into constructing. One other thing about Creepers that's a little, well, creepy, for a kids' game: their shape. Creepers have no arms, but they consist of a couple of foot-like rectangles, a long rectangle for a body, and a cube-shaped head on top. We're not sure where Creepers come from, but to anyone who's taken a health class, these little nuisances boast an appearance that reminds one of where life begins. In other words, they're undeniably phallic-shaped. What's with all the skeletons? Minecraft was born in Sweden, but it's popular all over the world now. That speaks to the universality of some of the game's elements, like the human imperatives to build shelter, find food, and survive…and how reanimated skeletons are an unsettling presence. 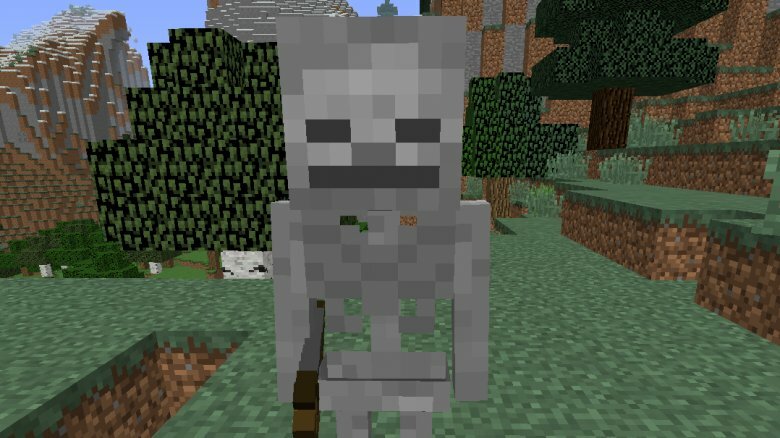 These walking, flesh-free assemblies of bone in a vaguely humanoid form are bad guys in Minecraft, taking aim against those they oppose with a bow and arrow. To kids who regularly play video games, this is no big deal — monstrous bad guys are a common occurrence in the digital world, be they aliens, zombies, ninjas, or barrel-throwing primates. But there's something about the more-realistic-than-fantastical world of Minecraft that makes these skeletons ominous — and there are just so many of them that an adult who thinks too much or too hard can't help but wonder about their origin. After all, if they're skeletons, they used to be people, and now they're dead. Are they haunting and stalking the game's protagonist because he was their murderer? Did he come to a remote, undeveloped terrain to escape them? Or maybe they were here before Steve, and he's building his many structures atop an unmarked graveyard? A preponderance of undead bone machines aside, there might be no more alarming character in Minecraft than the Enderman. 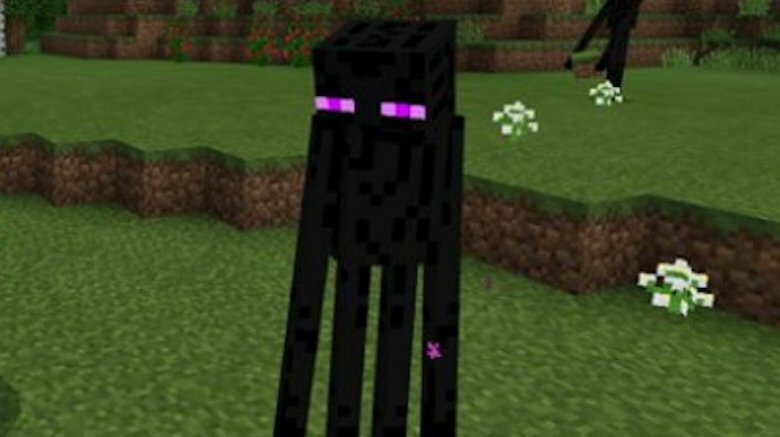 Generally found in the game's darker realms, such as the Nether and The End, these creatures sport long and gangly arms and are completely black except for their hypnotic purple eyes. However, they're not to be feared — they only attack if provoked by the player staring at them for too long. While designed to be background music, some of the melodies from video games past have legitimately grown into some of the most memorable tunes in the western canon — for example, the opening music to Pac-Man, the main theme from Super Mario Bros., and "Korobeiniki," an old Russian folk song most famous for being the music from Tetris. These melodies help propel the narrative of the game and get the player pumped up, level after level. But Minecraft is not like most video games. It's about building stuff, wandering around, and living and existing in a virtual world. 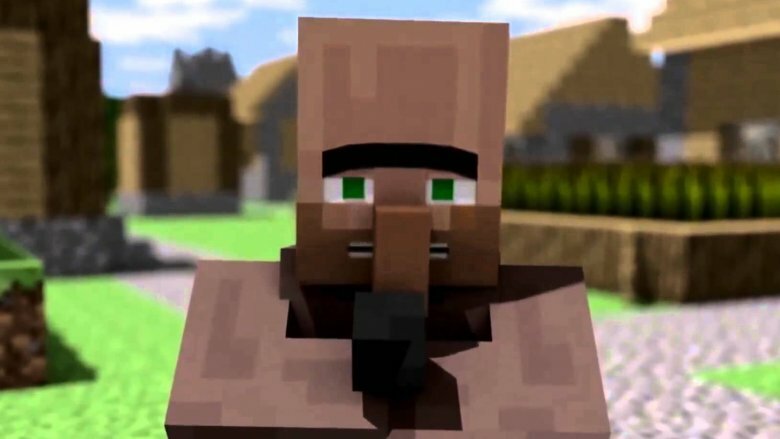 Reflecting that chill, exploratory tone is Minecraft's music, which is just as slow and hypnotic as the gameplay. Electronic and ambient, it really helps a parent hanging out with their kid playing Minecraft on the couch unwind…and probably fall asleep. The game's noises — stacking bricks, synthesized animal sounds — add to the wall of soothing noise and the notion that Minecraft might as well be titled ASMR: The Video Game. Older folks might find video games inscrutable, but maybe that's just because they're more complex and more difficult to understand and play than the games popular when today's parents were their kids' age. Honestly, is Minecraft any more or less weird than a yellow pie running from (or chasing) ghosts around a maze while eating as many white pills as possible? But of all the dissonant elements in Minecraft, perhaps there's none more perplexing than the wood situation. Players can create or find all manner of tools, such as shovels, hoes, shears, fishing rods, and anvils, which can be used to build. An axe is a viable tool in Minecraft, formed out of one of several different metals and a wood handle. 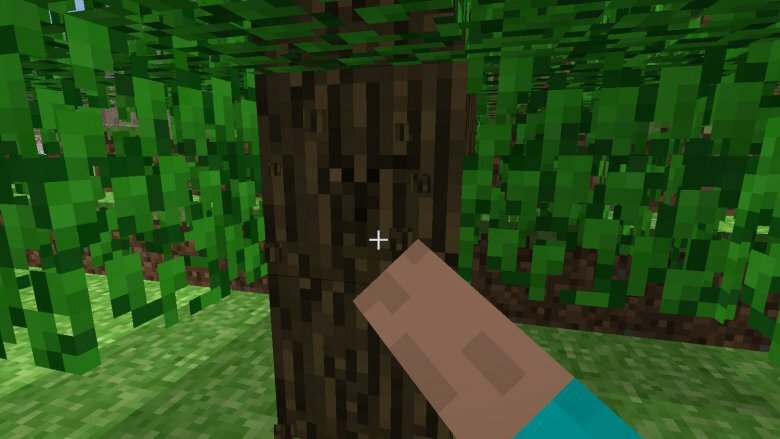 However, the easiest and most effective way to gather wood in Minecraft isn't by using that axe — players can just have Steve punch a tree. Yes, in this world in which tools must be carefully used correctly, the player can eschew their axe and place their hands to a tree, upon which chopped wood magically appears. Even more confusing to parents: That wood can then used to make one of those axes. Maybe kids who spend a lot of time in church, Sunday School, or reading Dante know what's up, but the common images of Hell — or Hades, or the Underworld, or whatever you want to call it — aren't generally as fearsomely ingrained in the mind of a child as they are in an adult. Parents have been alive a lot longer than kids, and are far more able to picture the worst-case scenarios for eternity after we die. Fire, brimstone, darkness, torture, horrific demons running the show — that's the Western idea of eternal torment. And gosh, it looks and feels an awful lot like one of the strangest, most unsettling, and subsequently well-titled biomes in all of Minecraft: The End. Some similarities between The End and "the end": It's Minecraft's final dimension, one has to go through a special portal to get there (as real people go "through" the act of dying), and it's surrounded by a black void and encased in darkness. 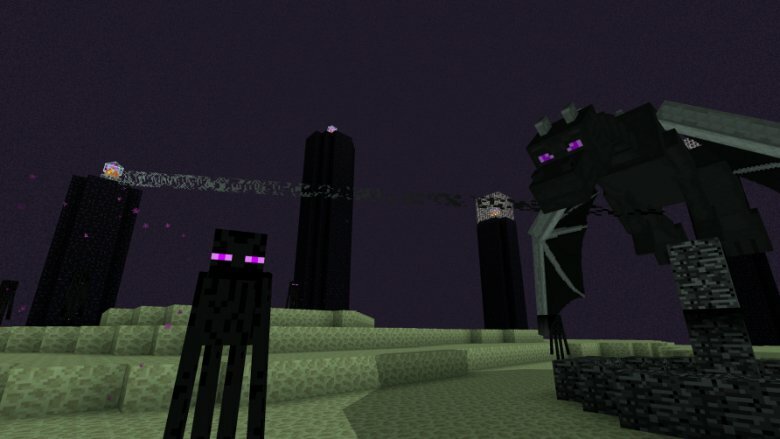 Monsters like the Enderman, Shulkers, and the Ender Dragon live there, too. By the time they're old enough to play Minecraft, most kids will have some idea of where babies come from. A brief refresher: some male genetic material mixes with some female genetic material, and there are a lot of ways to make that connection happen. 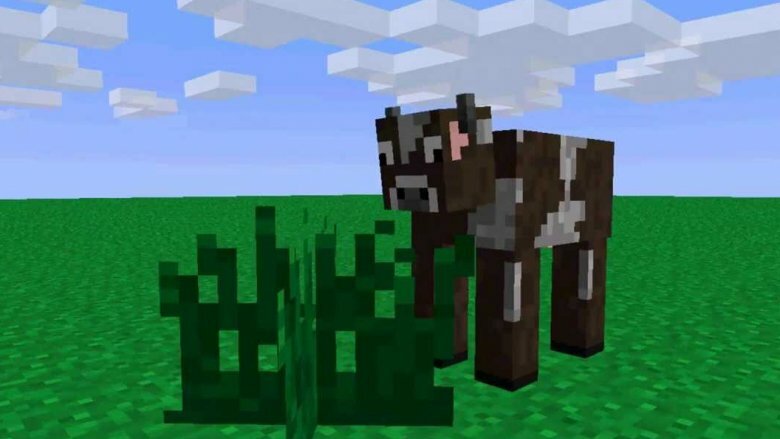 Animals also follow this physiological norm, although in Minecraft, the many different types of livestock are said to "spawn" rather than "breed." That's a subtle clue into the way babies actually are made in Minecraft. According to Notch, the animals in the game are genderless. The cows have both typically male and female features (horns and udders), and the chickens "have heads that look like roosters, but still lay eggs." A member of a species can then breed with any other member of that same species in Minecraft. This means Minecraft is completely non-binary, which is incredibly "woke" for a video game. Adults are by definition mature, but only physically. Mentally, they can still be childish or have a puerile, juvenile sense of humor. This means some adult gamers or observers can't help but notice and laugh at even the most mildly titillating-seeming elements of Minecraft. Sure, a Creeper looks like the male reproductive organ, but also, the Villagers in Minecraft were once labeled (and are still often referred to by players) as "Testificates." They're the "extra" of Minecraft — neutral, non-playable background characters pre-loaded by the game in some modes. They just hang out in their little towns and eke out a living, only for human players to gawk at their silly names that sound just like the name of the thing that a Creeper's feet resemble. Sure, that name is probably just programmer language, playing off of how they were once a "test" feature in early versions of the game back in the day, but still — whether their name was intentionally meant to be sort of dirty or not, it's still funny. By and large, kids have it relatively easy — those who play Minecraft have enough money and stability that they get to play Minecraft, after all. They're frequently sheltered from the crushing concerns of adult daily life, such as having enough money for one's family to live or maintaining a safe and healthy living environment for their children. Still, Minecraft subtly offers kids a chance to understand the uniquely adult frustrations of being a homeowner. 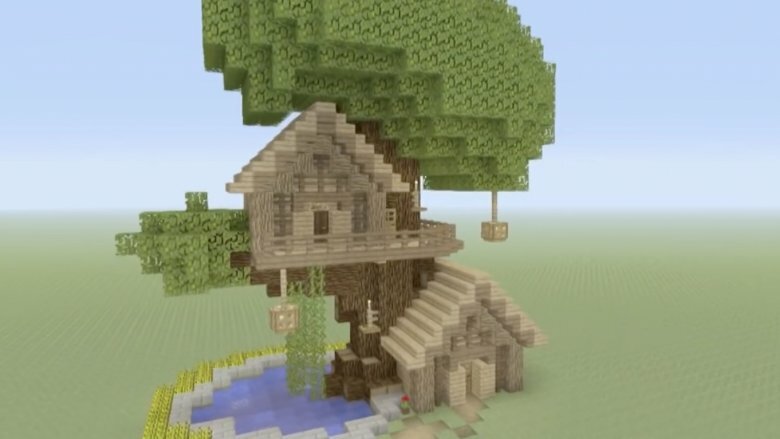 Kids can spend endless hours building up their perfect dream houses in Minecraft, mining for the right materials and combining them just so with the correct tools to create a remarkable structure. But one false move, and the whole thing could literally fall apart. Or everything might be perfectly executed, only for a random Creeper to come along and blow up the house for kicks — and if you think about it, that feeling is vaguely similar to the anguish of your real house's water main bursting in the dead of night over a holiday weekend.